The Perfect Stink Bug Trap is All Natural! For an update to this story click here. The scent of Cilantro may go fine with dinner, but not if it’s from a stinkbug that fell into your enchiladas. The invasive pests are now in 41 states, the district of Columbia and Canada and several countries in Europe. They destroy crops and frustrate humans, with whom they share a penchant for sheltering indoors in cold weather. Now scientists at Virginia Tech have come up with stinkbug trap you can make yourself for a couple of bucks-- that works. Listen to the story by Robbie Harris. No matter how good a housekeeper you are, it’s not easy to keep stinkbugs from ruining your image. “I remember this fall I had houseguests and when they arrived at like 8 in the evening I said OK as of 7:00 when I last swept the room, there were no stink bugs in there but I won’t guarantee that you won’t find some during the night because we did have a lot of them," says Pat Hipkins of Newport Virginia where the bugs have quite a presence. The winning stinkbug trap, turned out to be the one created by Virginia Tech a low tech, low cost device made from everyday items. Virginia Tech PhD student John Aigner ran the study, with what he calls, ‘citizen scientists’ like Hipkins, collecting the data. He says the trap design is not a new idea. It’s similar to one his Dad used to trap fleas. To the Brown Marmorated Stink Bug, the soft glow of a light bulb illuminating the water looks the way an ad for a winter vacation getaway to looks us; a sunny place to flock to and possibly find a mating partner. But like a vacation package that doesn’t deliver as promised, the light is just a lure and the soapy water, a trick. 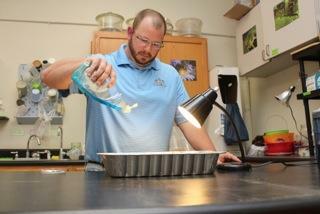 The turkey pan stinkbug trap proved 14 times more effective than the other models. “It’s not a glorious demise by any means, but I’m an entomologist I don't’ don’t have a problem with them." For the two-year study, the light was switched on at 7 pm and off at 7 am using timers. It’s important to be sure there’s no way the lamp could get knocked into the water. But that’s about it for any safety hazard for humans. No chemical pesticides involved. Aigner says that’s surprising to the hundreds of people who call the University’s cooperative extension to ask what they can do about stinkbugs in the house. And it is in agriculture where stinkbugs are taking a huge bite. They were first seen in Pennsylvania in 2001, -- stow aways from Asia. It’s that same tendency to seek shelter indoors that makes them excellent travelers. By 2008 and 9 they were gaining a foothold. 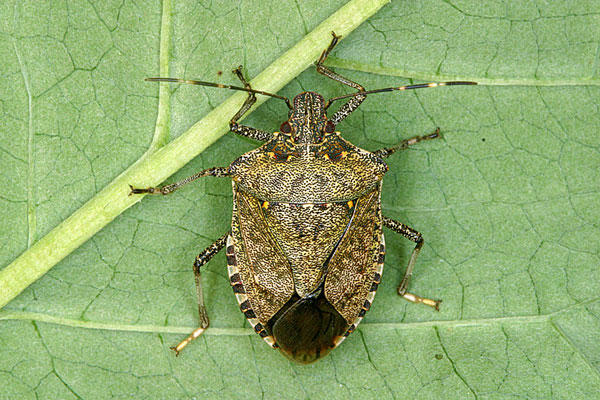 “And then in 2010, that was the big outbreak year," says Tracy Leskey with the Tree Fruit research Lab in West Virginia, the research leader of the Brown Marmorated Stink bug Working Group. She says that year the mid-Atlantic apple trade association calculated a 37-million dollars loss from stinkbugs. Figures aren’t available for damage to other US crops, but the bugs don’t discriminate, and go after a huge variety of fruits, and vegetables, from farmland to home gardens. 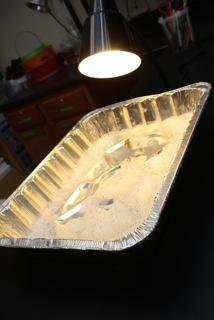 Lesky has been studying how different wavelengths of light affect stink bugs’ behavior. She thinks one reason the Virginia Tech trap turned out to be the most effective might be because it uses a broad-spectrum light bulb, not an LED. Lesky says the working group is studying how the bugs behave in order to learn how to control them, not eradicate them; something she says is nearly impossible anyway. One promising approach is a predator native to China. The non-stinging wasp that preys on the stinkbug is now under quarantine in labs around the U.S. They’re being evaluated before they can be released into the environment. But that won’t be in time for this year’s mating season, which is going on right now. The lengthening daylight is drawing the strongest stink bugs back outdoors, while the weaker ones continue to laze around the house and mess up the place, so Pat Hipkins is still using her turkey pan traps. But don’t try to use the light traps in autumn when the bugs head back indoors. They won’t work as the days grow shorter and the sunlight wanes. That’s because the bugs are attracted to light in spring only, when the lengthening days signal the time for mating. And entomologists know the Brown Marmorated Stink Bug prefers to do that with the lights on.